Puerto Vallarta offers world class yellowfin tuna fishing with tuna in excess of 300 pounds along with Blue and Black marlin, pargo, and dorado just to name a few. These limited load (6 passenger) fly down fly back adventures depart from marina Nuevo Vallarta just minutes from the international air port (PVR). On these unique trips you as the angler can go from door step to the rail of the Success pulling on a cow in less than twenty-four hours. On these 2.5 - 5.5 day all inclusive trips the angler can minimize travel time and maximize fishing time. All of our trips are outfitted with top of the line Avet and Seeker rod and reel combos allowing the angler to pack light for easy travel. 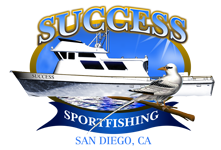 While aboard the Success you can expect first class service from our 5 crew members and dedication to perfection, putting you the angler on the fish is our passion. Fish handling aboard the Success is second to none, all fish are dressed on deck and then submergered in 30 degree sea water before being processed and vacuum packed for your flight home. Come join us on an open party or private 6 passenger charter and experience the comfort and ease of our fly down fly back experience. INCLUDED: MEALS, SNACKS, NON-ALCOHOLIC BEVERAGES, FISH PROCESSING (LIMITED) TO 50LBS FILLETS VACUUMED PACKED PER PERSON, & ROD AND REEL COMBO (20-30, 40-60, 80-100, 100-150) OUTFITS PER PERSON. TRIP INCLUDE BAIT.